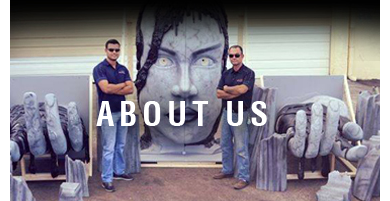 Foam Sculptures of any kind Custom Made. Fiberglass molds for production of sculptures if needed. Do you want to advertise effectively to potential customers or clients? Do you have a special event revolving around a specific theme? Please contact us by the method that is most convenient for you. Most people already will have a good idea of what they are wanting. During your 1st initial consultation with us by phone or in person we will ask many questions to make sure we have a vision of what you are wanting us to create. At the time that an idea has been thought of and it's on paper, we will then start sculpting the foam. Do you want to advertise effectively to potential customers or clients? Do you have a special event revolving around a specific theme? Please contact us by the method that is most convenient for you.